I saw a pallet garden on Pinterest — where else? (original post here) I have wanted pole beans in my garden again, but rabbits — the bane of my existence — have prevented me in recent years from having them. RABBITS EAT EVERYTHING I PLANT!!! Julia's pallet garden. That milk jug? It's my drip irrigation system. My strategy: to put herbs and tomatoes in the bottom openings; pole beans in all upper openings. Hopefully this keeps the rabbits from eating my beans. I want to feed myself, not the rabbits. So far everything is growing well, but nothing is growing in the upper slots or the top. Read on to see why they are empty. My advice: USE A STANDARD SIZED PALLET IF YOU DO THIS. Holy cow — I used four bags of soil and it did not fill the pallet! The original post calls for two x 40 lbs. bags of soil. Mine was very heavy to move around. That’s 120 lbs, folks! My hopes: that everything grows well. I haven’t figured out how to water the plants well. Without a large network of roots, the soil falls out when I put water in the slots from the front. So I’m concerned. I’m trying to water from above with my milk jugs and the plants are growing as expected, so I think I’m OK. For now. Maybe rabbits are lapping up the water when my head is turned. 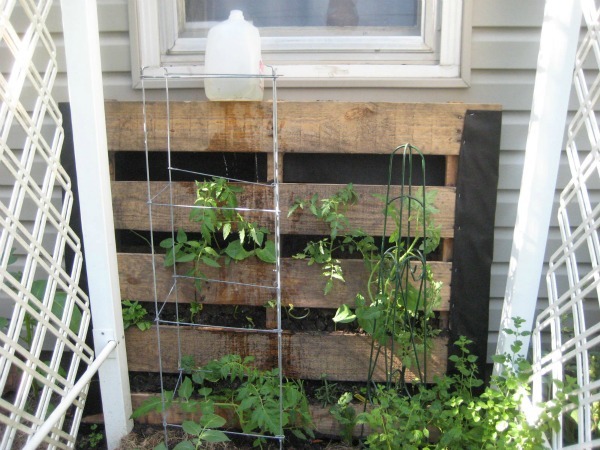 This entry was posted in crafting, food, frugal family and tagged garden, pallet. Bookmark the permalink. Looking great! And thanks for all the tips…I was thinking about doing this but never would have thought about pallet size vs. dirt/weight ratio!